You know the story. It’s all going brilliantly: the diet, the study schedule, the workouts, the commitment to practice learning a new language. Then something comes along and messes it all up. Before you know it you’re in a downward spiral. You ate that donut, so the rest of the diet can go out the window. You missed a workout so you may as well wait until next week to start the new routine again. In my case, I missed a few days of writing and drawing over the weekend. I prioritised other things. It doesn’t feel good to know I’m never, ever going to get those hours back. But there’s nothing to do about it now other than to get going. 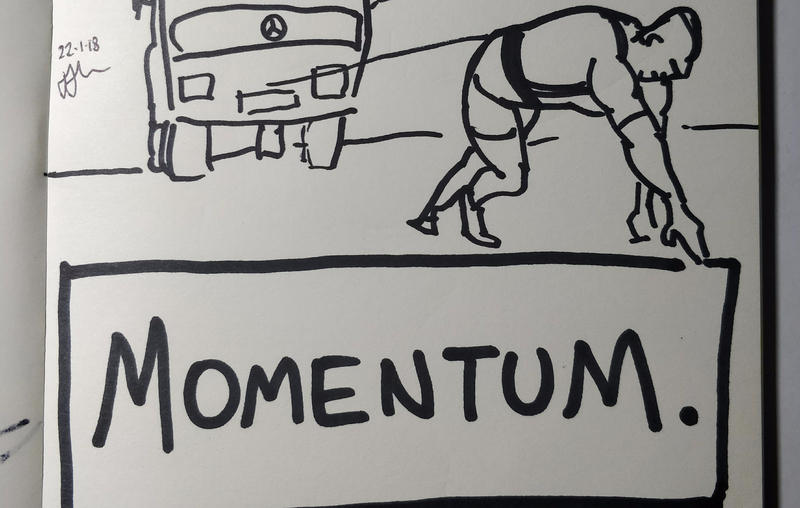 Think of a strongman dragging a lorry (or truck for any of my American readers). They push off, straining, every tendon taut. It’s hard at first, but they start making progress, inch by painful inch. As soon as they start to slow down, even slightly, it’s essentially impossible to get going again. So keep the momentum up for as long as you can. When you mess up (which you will, and I will), leave as little time as possible before getting back to work. Don’t give yourself a chance to breathe. Don’t let the thing you’re hammering at stiffen and set – get right back to pounding at it until it’s red hot again. Today, I got back on the horse. And that’s good enough for now. Well said. Great comparison to the strongmen pulling trucks.